Taittiriya Upanisad occupies an unrivalled place in the Divine Tradition of Hinduism. The Upanisad, declares a manifesto upon the 'Hindu way of Living'. "Speak the Truth. Do your duty. Do not neglect the study of the scriptures. Do not cut the thread of progeny. Swerve not from truth. Deviate not from the path of good. Revere greatness." "Let your mother be a God to you; let your father be a God to you; let your teacher be a God to you; let your guest be God to you. Do only actions, which are blameless. Always show reverence to the great." These Commandments have a democratic Hindu touch which is the unique speciality of Hindu philosophy. "He who realises Brahman attains the Supreme Brahman is Truth, Knowledge and Infinite. "He from whom all beings are born, having born in whom they live, and to whom they return at death-seek to know him. He is Brahman." ....Seek to know Brahman by meditation. 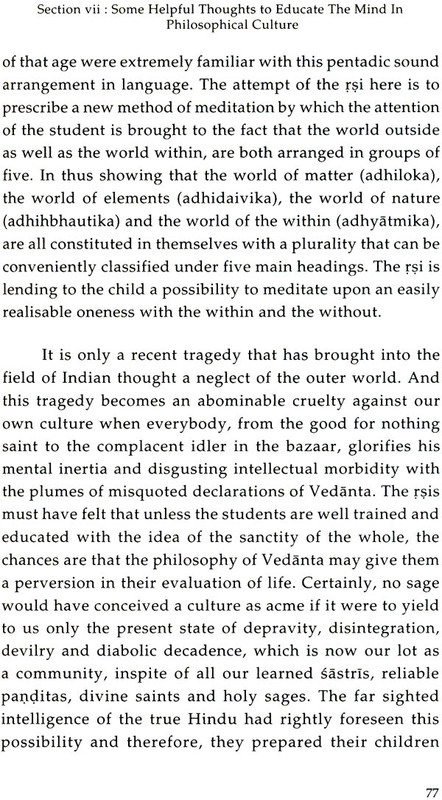 In his commentary on this Upanisad, the journalist, the logician, the scholar and the master of English Literature--Svami Chinmayananda is at His best. An attempt of the finite to explain the Infinite is the content and import of all the scriptures of the world. The Upanisad-s are exceptions to this rule. To define the Infinite is impossible, although, through words we can certainly indicate the Truth to one, Who is ready to recognise the indication, following up the directions and come to experience Godhood. Any fact can ordinarily be indicated through two methods: one is the direct method of positive description and the other is the indirect method of indicating what the thing is not. Thus to indicate an ocean, we can directly explain it as an endless expanse of water surging and seething on its surface with its waves, but calm and tranquil in its unplumbed depths; and indirectly it can be indicated as that which has no outgrowths on it, that which is not solid, that which is not motionless, that which can never float in the air. Similarly, Truth also is directly indicated by attributing to it certain qualities and indirectly it is indicated through its own manifestations. The direct method is called in Samskrta; as an explanation through, Svarupa-Laksana, and the indirect method is called as the Tatastha-Laksana. As for an example, in indicating the house of Mr. Gupta in a street, we may directly do so by describing it as, "that two-storeyed building with the porch and. balcony, with decorations round the window Sill," or we may indirectly point out as "the house next to that mango tree" or as ''the house upon which that crow is sitting." Here the mango tree and crow are something other than Mr. Gupta's house, but they are indicated to show through them ultimately Mr. Gupta's house. In this Upanisad, unlike in any other scripture in the world, the subjective Reality, in the seeker, is indicated both by the direct method of explanations and by the indirect method of indications. In the second chapter, there is a direct attempt at definition of the Truth in "Satyam, Jnanam. Anantam," and the text contains in its bulk the indirect indication of the Pure Consciousness through an elaborate description on the various matter-envelopments and the personality-layers in man. Nowhere in the world do we get such a complete study of the human personality in all its exhaustive features as in the Taittiriya Upanisad. Even in the tradition of Vedanta, the only occassion when we get a clear description of the Five Sheaths (Panca-Kosa-s) is in this famous Upanisad; and its fame mainly rests' upon this extremely direct method of self-enquiry that it prescribes. 'This Upanisad belongs to the Krsna Yajur Veda and forms part of its Taittiriya Aranyaka. There is a beautiful story that traditionally describes the title Taittiriya. 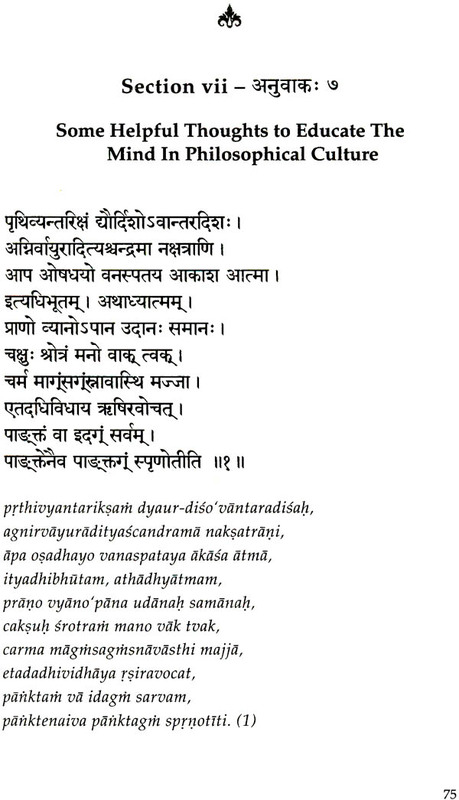 It is said that this portion was taught to Yajnavalkya by his Guru but at the end of the studies the Guru got annoyed with the disciple and asked him to return all that he learnt from the teacher, Yajnavalkya, it is said, vomitted out all that he learnt seeing which the Guru advised his disciples to turn themselves into Tittiri-birds (sparrows) and consume the 'vomit.' They did so and thus they came to master this Aranyaka. 'This story need not give us any disgust at all, if we understand it properly. Annoyed at the lesser students of the class-room, the teacher asked Yajnavalkya to repeat the lesson that he had taught and the genius of Yajnavalkya 'vomitted' what was taught to him. When a student has absorbed a knowledge and when he gives it out, it becomes more palatable to the other students of the class-room, who could not so efficiently understand it directly from the teacher's learned discourse. Seeing that the delivery of Yajnavalkya was masterly, the teacher in appreciation asked the other students of the class to absorb it in the form of the "sparrows" which they did. Of all the birds, sparrows are most energetic and industrious; the two great qualities that are unavoidable for any diligent student of vedantik literature are indicated here. 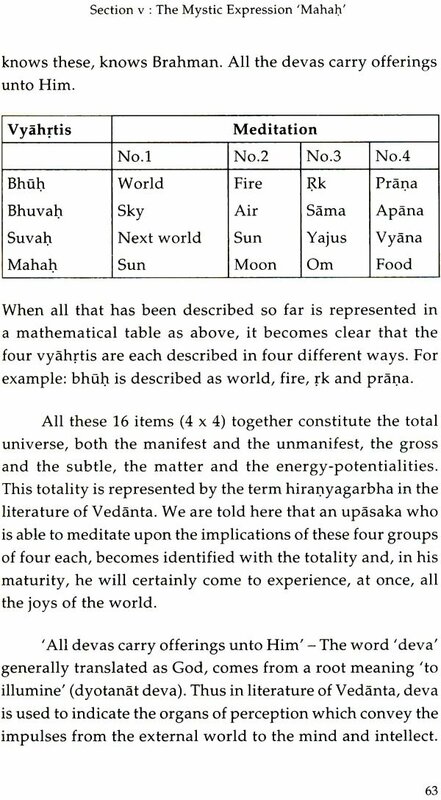 (c) Bhrgu Valli-a section in which we are shown the practical application of the philosophical theories propounded in the previous valli-s, and also, the section emphasises the need for constant enquiry and consistent meditation if a student is to come to enjoy a guaranteed success in the path of Vedanta. Apart from the philosophical interest, the Upanisad gives us a vivid picture of the exhaustive training that was given in the educational system of that day, which ensured the development, the growth and healthy sustenance of the brilliant Hindu-culture of that Vedik period. The all-comprehensive instructions and the definite advice on "how to live Vedanta in life" are given by the teacher to the students-in the end of the first section on two occasions in the Valedictory Address and in the Convocation Message. Immediately, our country needs a special study of these two portions which in clear terms hoot down our impotent Hindu misconceptions of our "Ideal Life." Reconstituted on the basis of these healthy suggestions, we can certainly rebuild a Hindu India of Spiritual Communism based upon mutual love, reinforced with the cement of Hindu Brotherhood. In it, one can clearly see a healthy message for the war-tom world labouring under its own misconceptions of what life is, and its own wrong evaluations of the factors that cosntitute true living. We all know that much of our ancient literature is now extinct. There were as many as 1180 Sakha-s of Vedik literature. It is believed that each school had one Upanisad attached to it. 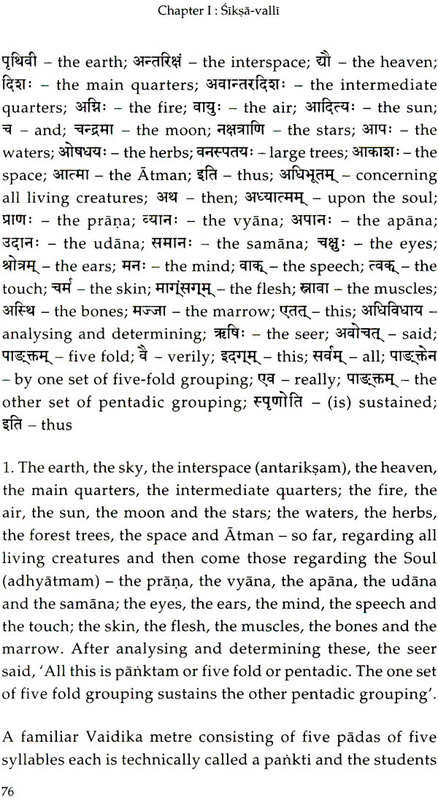 Of about 280 Upanisad-s unearthed so far, 108 have been generally accepted as authentic texts? Out of these, eleven viz., 'Isa, Kena, Katha, Prasna, Munddaka, Mandukya, Taittiriya, Aitareya, Chandogya, Brhadaranyaka and Svetasvatara,' in that order, have been commented upon by the recent master-minds Acarya-s like Sri Sankara, Ramanuja and Madhavacarya, and are thus classified as 'Major' or Principle Upanisad-s. Some do not accept commentary on the Svetasvatara Upanisad as that of Sankara Bhagavatpada and thus acknowledge only ten as Major Upanisad-s. 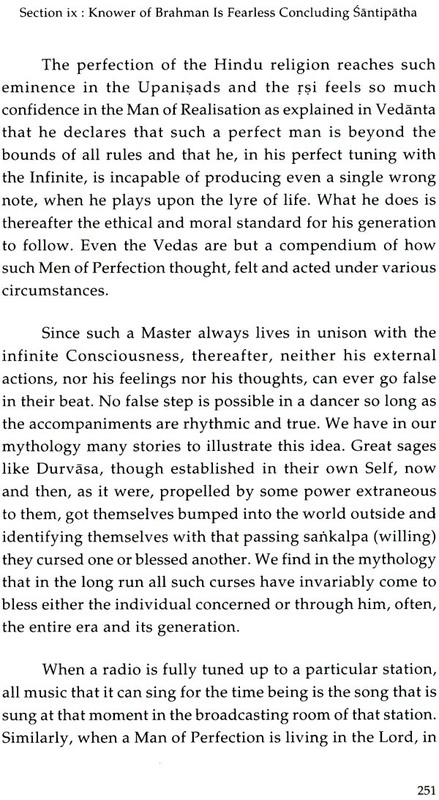 The other Upanisad-s are considered as 'Minor'-not an account of their contents, or in the depth of their thoughts, or in the completeness of their exposition but because no commentaries are available from the great Acarya-s . The new initiates are generally prescribed these minor Upanisad-s only after a thorough study of the exhaustive commentaries (Bhasya-s) by the great Masters on five or six of the Major Upanisad-s. 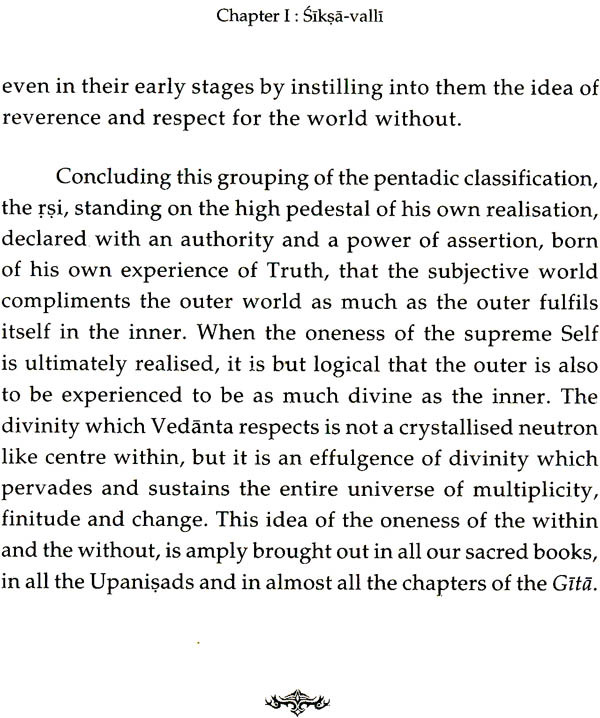 Thus, these became 'minor' only with reference to the knowledge the students have already acquired as a result of their study of the "main" Upanisad-s and their reflection on these 'minor' ones serves as an interesting revision of the knowledge already gathered. All Upanisad-s-Major or Minor enunciate the one goal which is liberation, and prescribe techniques of achieving that goal-are of equal importance and value. The classification- major or minor-is only to distinguish the well-known ones commented upon by Sankaracarya. 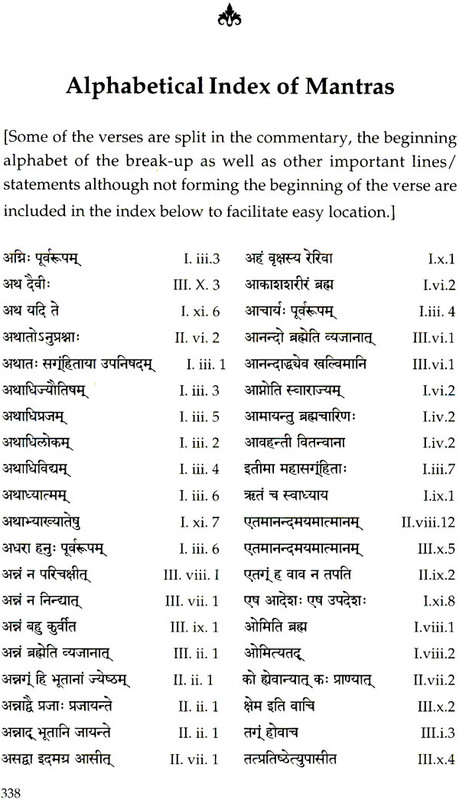 The super-human genius that was Veda Vyasa, for the first time gathered Vedik mantra-s, recorded in written language, and classified the entire wealth of Vedik knowledge into four volumes in a harmonious rhythm, both in the arrangement and classification of contents. 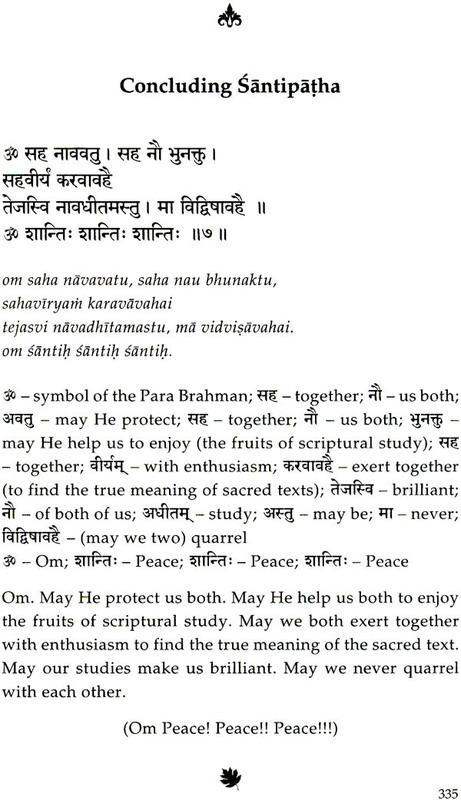 Each Veda was further divided into broad three sections--mantra-s, brahmana-s and Aranyaka-s. The mantra portion contains expressions of wonderment, joy and ecstasy at the choking visions of beauty in nature's exuberance. They worshipped through the mantra-s the dignity of the mountain, the majesty of the sun-rise, the beauty of the moon, thee grandeur of the ocean and such other phenomenal powers. 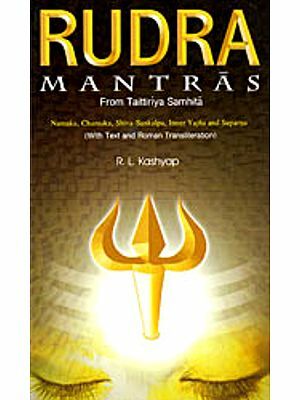 The second section i.e., Brahmana portion contains detailed and scientific description of methods of various ritualistic performances and secret methods to invoke the Mighty Powers behind the nature to bless the devotees' desires into fulfilment. This section is further divided into two sub-sections--Karma Kanda and Upasana Kanda. 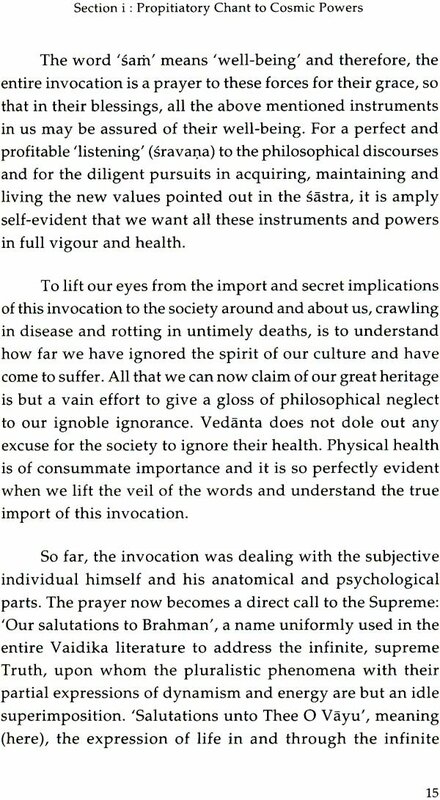 The grosser rituals, their rules, prescriptions for various Yajna-s form the first sub-section, while comparatively subtler meditations, that are part and parcel of Vedik ritualism, form the second sub-section. The attempt of the Upanisad-s is to express the inexpressible, to paint the Formless, to sing the voiceless beauty and bliss of the Absolute. The finite words are no instruments to reach the roaring silence of the all-full Spiritual Perfection. Even in our ordinary experience, when we have to voice forth our intimate subjective experiences, we know that language fails in its own limitations. It is only a superstitious belief that language can do wonders everywhere: except perhaps, in the market place and in the banker's office, everywhere else it must feel choked. Factual ideas directly perceived through the five-sense-organs can be expressed, to an extent, by means of sound symbols which have, by mutual consent, come to represent literally some uniform meaning. Thus, a Botanist can, with ease and efficiency, describe the flower, part by part, but when the poet enters the field to express the message of the flower and the thrills of beauty it has produced in him, the trembling sentiments and the throbbing emotions must snap the silver strings of every language. Even when such an ordinary experience as a taste or a touch or a vision cannot completely be explained and fully be conveyed through words, we can easily understand how impossible it is for words to express the tranquil experience one gets when one has transcended consciously the body, mind and intellect. From that it should not be concluded that the experience of the Infinite cannot be conveyed and is not available for the teachers to teach. From the above, we must only understand that a language, which is generally used to express the finite experiences, is employed in the scriptures with a difference. In objective descriptions, words are used in their direct import, but in expressing the subjective experiences the same words are used, together with their ringing notes and the suggestive imports, Every word has in combination with other, a direct literal meaning and an indirect pregnant suggestion. This suggestive-ness implied in each word is often used in everyday life. "See that the crows do not come into the Dining Room" does not mean that vultures and doves, dogs and cats, rats and cows can freely come and poison the food. Here, the word "crow" no doubt means literally that black bird of harsh looks and ugly melodies, but in the content it indicates all the animals and undesirable intruders into the Dining Hall. Examples can be multiplied to prove this: that words have got not only their literal meaning but, by usage, they gather a suggestiveness of their own, stored up in themselves as their special flavour. The inexpressible Infinite Truth is thus indicated by these words of the scriptures. It is not openly and directly expressed. This is true in almost all other religions when the Prophets are in extreme ecstasy of their own mystical experiences. But, in Hinduism, we find that throughout the Upanisadik lore almost every word of it is used to express the suggestive sense.